Perhaps 9 out of every 10 times an owner responds snarkily to a bad Yelp review, it winds up making the owner look worse by comparison. If so, this is the 10th time. Update: Yelp e-mailed us to claim that Denham had not left a review on Yelp, but merely on Facebook. This stands in direct opposition to multiple sources that claim she did use Yelp and that the review was later deleted. However, in the spirit of generosity, let’s assume they’re right and Denham didn’t actually leave a Yelp review. Even accepting that as true, unless the Daily Dot has gone to rather incomprehensibly extreme lengths to photoshop the image in this post, someone else in the same party as Denham named “Kris K.” absolutely left a negative Yelp review. Given that, Yelp is still a part of this story, whether the company wants to be or not. 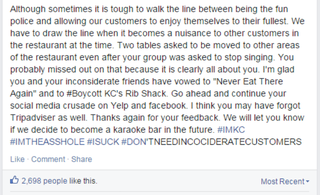 As someone who regularly gets annoyed at obnoxiously loud groups of people at restaurants (seriously, people, shift your noise level to the general noise level of the restaurant itself, this isn’t difficult),* it should come as no surprise that I’m pretty solidly TeamKC’s here, even if Cornish apparently can’t spell “inconsiderate.” As far as I can see, at no point did Cornish step over any lines. He didn’t devolve into an unhinged, misogynistic rant, he didn’t go pedal-to-the-floor racist—hell, he didn’t even post a picture of the customers. All in all, this is probably the single tamest owner flame response to a bad Yelp review I’ve ever seen. Also, inviting them to make sure they remember to leave bad TripAdvisor reviews and saying “Thanks again for your feedback. We will let you know if we decide to become a karaoke bar in the future” are some pretty sick burns,** so points there. * To be fair, it could be worse: they could be one of those groups that stands around by the bar at a sit-down restaurant and completely blocks off the path for servers to get to their tables. There is a special level of hell reserved for these people. ** The latter is pretty much the “cool story, Glenn” of owner responses to bad Yelp reviews.